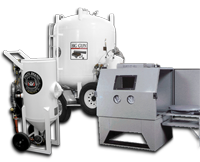 Whether you need a blast room, a blasting cabinet, or any other type of abrasive blasting equipment, IDS Blast will get you the setup you need. Much of our blasting equipment is available for purchase directly online but for some specialty equipment or larger abrasive blasting equipment, pricing will be available by quote only. These items may still be added to your shopping cart but will be submitted for quote at the checkout process. If you have questions about a piece of sandblasting equipment, or if you are not sure exactly what you need, our knowledgeable staff is ready to assist you. Contact us and we will make sure you get exactly the right equipment.